Sharpen your style with this Delicate Crystal Bow Bracelet. 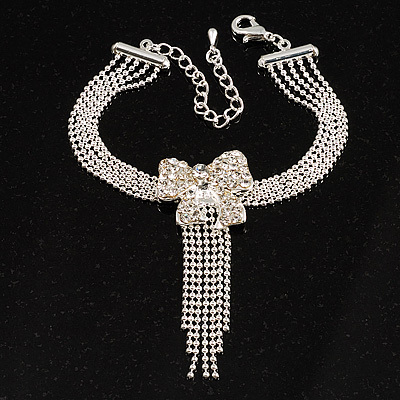 Featuring a charming crystal bow (20mm x 23mm), decorated with a beaded tassel (45mm in length), offering a unique style. It's crafted in rhodium plated finish for years of elegant wear. The bracelet measures about 14cm with 6cm extension and secures with a lobster claw clasp for a reliable fit. Top quality fashion jewellery at a fraction of retail price.